Her hair made it past the shoulders when she was about two years old and just kept on growing. 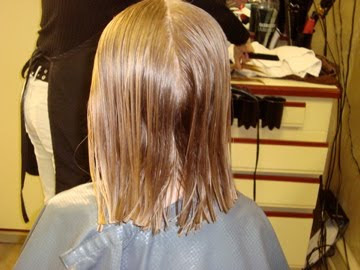 Sure we would take her for haircuts, but they were mostly just "trims" and the most she'd ever get cut was 2-3 inches. Part of the reason we never cut it any shorter is that I was enjoying all of the things we could do with it; learning to braid it, put it in a bun, etc. 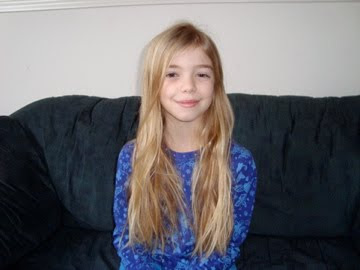 The other reason is that her daddy loves the long hair on his girls, and he really wanted her to keep it that way. She looked so darn pretty with it, who could argue with that!? In Kindergarten, Kiki had a friend with the condition, Alopecia areata, a common autoimmune skin disease resulting in the loss of hair. 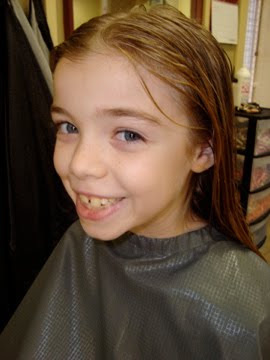 When I learned of this, I mentioned to Kiki that maybe she could someday get a big haircut and donate her hair for some little girl who couldn't grow her own, or who had lost her hair due to an illness. Of course Kiki was only five at the time and was a bit horrified at the idea of someone else "wearing my hair, " so I let it drop. 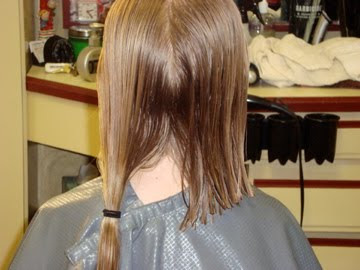 However, while Kiki's hair was quite long, it wasn't long enough to meet the requirements of the different hair charities that accept hair for donation. So Bill and I told her to wait. 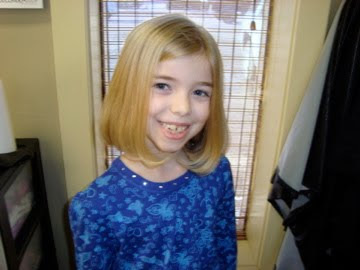 Take some time to really grow it long, and then maybe get it cut before third grade. Finally that time came and it still wasn't quite long enough. 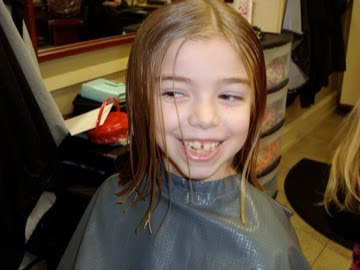 There was probably the minimum ten inches to donate, but Kiki wanted a certain style and we knew that she would not be able to if she had her haircut then. So, once again, we talked her into waiting. I told her that she should easily have enough hair by Christmas vacation. Flash forward once more to December 2009, just before Christmas. I measured Kiki's hair and, lo and behold, it was finally long enough. So I scheduled an appointment and just a few days shy of 2010, she finally got her big haircut. Let me just tell you, I've never seen a child so excited about a haircut. Kiki was so excited she practically skipped into the beauty salon. 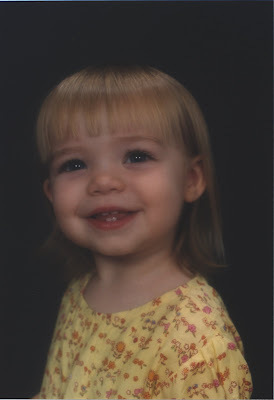 This was the same child who I used to have to hold on my lap while someone trimmed her hair. The same child that loved braids, buns, curls, bows, and ponytails. 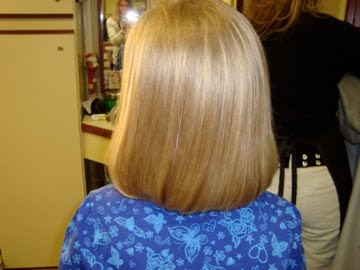 I kept asking her if she was nervous about cutting so much off (I know I would have been) but she insisted she was not. After the haircut was finished, she kept admiring herself in the mirror and swinging her head around, enjoying the way it felt to have her hair bounce around at her shoulders. I can't imagine how much lighter her head felt. I've had long hair before, but nothing close to as long as hers was. I think what I loved most about this whole experience for Kiki, was how excited she was to do something for someone else. She wanted to do this all on her own. 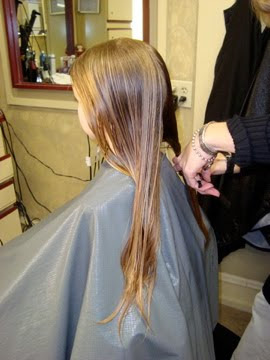 Every time we talked about getting her haircut, she'd mention how she couldn't wait donate her hair. She said she didn't have money to donate, but she had a lot of hair, and she knew that would make some other little girl happy. Kiki asked if she would get to see who got her hair, and was disappointed when I told her "no", but she understood. 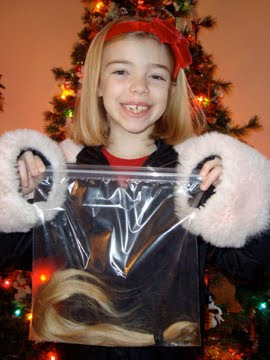 We mailed her hair off to Locks of Love on New Year's Eve. 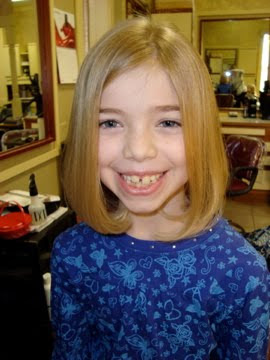 Kiki chose that one because she knew the charity specifically helped children, and while she understood adults sometimes lose their hair too, she wanted to help someone closer to her age. I am so incredibly proud of my daughter. Kiki already has said she is going to grow her hair out again, and donate more when she has enough. She's inspired her little sister, Boo, to want to do the same. Who knows, maybe I will follow suit. . .
Kiki checks it out. . .
What an amazing thing for her to do! I've donated to LoL twice now. My hair grew fast and thick with my pregnancies so it didn't take long. I hadn't planned to grow it out for another donation... but just might do it again! Jillian and I both did this about two years ago. Jillian donated 11 1/2 inches and I donated 22 inches! WTG Kiki!!! Absolutely amazing. And beautiful. And thoughtful. She's lovely! And not just with her new do! Love that she's so willing to donate for someone else in need. She's amazing and beautiful - inside and out! So wonderful your little girl is growing up with such fine qualities. Kudos to you for being a wonderful mom, and Kudos to Kiki for being a child wanting to help others.